Chip Scale Test & Burn-In Sockets Test & Burn-In of Any SMT Device! CSP BGA LGA QFN DSP SRAM DRAM Flash Devices, etc. 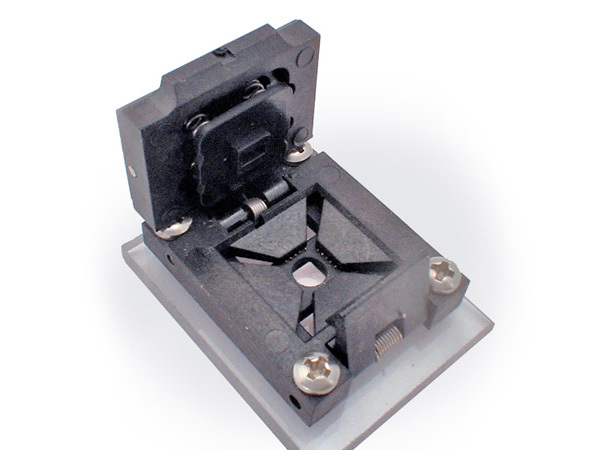 "Aries, the world leader in Spring Probe Test & Burn-In Socket Technology"
A CSP Socket showing hole for a heat slug in the center to dissipate heat, or transfer heat to a PC board or heatsink. For any SMT footprint, with Spring probes any pitch .3 mm and up. Roll Over Thumbnails, View Larger Image. Top view of heat slug area and internal vents. Sockets are shown with Heat slug removed. Inside view of lid area and air vents. Sockets are shown mounted on plexiglass simulating a PC board. Drawing showing top and side air vent locations. Drawing view of Heat Slug socket with heat slug shown in orange. The bodies of these sockets are molded and the interior interposer drilled for the spring probes, device guide, pressure pad, and heat slug hole are machined for your exact device footprint, saving you dollars and with equal or better performance than a fully machined socket. The mechanical hold down, (2 or 4 screws for this family of sockets) and the alignment pins are standardized Aries footprints, to which we add your device footprint for a perfect fit. Where you require a different mechanical hold down or alignment, we also make fully machined sockets to suite your needs with the same Aries high reliability Aries Patented Spring Probes for outstanding performance. Send us a device drawing for a quote today.